DARWIN TOWNSHIP, MN – A Litchfield man suffered noncritical injuries in a motorcycle crash early Wednesday morning. According to the Minnesota State Patrol, at 5:48 a.m., a 1994 Honda M/C ridden by Scott Durken, 57, was westbound on Highway 12 at mile post 108 in Darwin Township when the motorcycle struck a deer in the roadway. Durken was transported to Meeker County Memorial Hospital in Litchfield. He was not wearing a helmet at the time of the crash. Road conditions were dry and alcohol was not a factor, according to the State Patrol. ST. PAUL, MN – Stretches of Highway 15 and Highway 12 in the area are among 5,240 miles of state highways on which the Minnesota Department of Transportation is increasing speed limits, based on the recommendations of a five-year study made available Wednesday. The speeds will increase from 55 to 60 mph. Speeds are being increased on Highway 15 from Hutchinson to Dassel and from Dassel to Kimball, and on Highway 12 from the beginning of the two-lane highway west of Darwin to Darwin, and from Darwin to Dassel. No speed limit increases were recommended for Highway 12 east of Dassel. In 2014, the Minnesota Legislature mandated that MnDOT study all Minnesota two-lane roadways with a speed of 55 mph. The study is also the largest system-wide change in Minnesota speed limits since the national maximum speed limit of 55 mph was included in President Nixon’s Emergency Highway Conservation Act bill in 1974. Later that year, the Minnesota Commissioner of Highways established an executive order about speed limits. The recommendation for a speed increase along each of these roadways considered the speed that 85 percent of motorists drive at or below, along with an evaluation of other factors; such as access points, shoulder width, vertical grades and crash history. MnDOT has conducted before-and-after studies on many roadways that recently increased speed limits to 60 mph. There was no change in the overall 85th percentile speed from before the speed limit changes to after. The average speed of all drivers increased by 1 mph and the standard deviation, which is the measure of how spread out the drivers’ speeds were, reduced slightly. According to Drews, a properly selected speed limit can potentially increase the safety of the roadway by creating uniform travel speeds for all vehicles. MnDOT plans to study the effect of the changes over several years to ensure these roadways continue to operate safely. 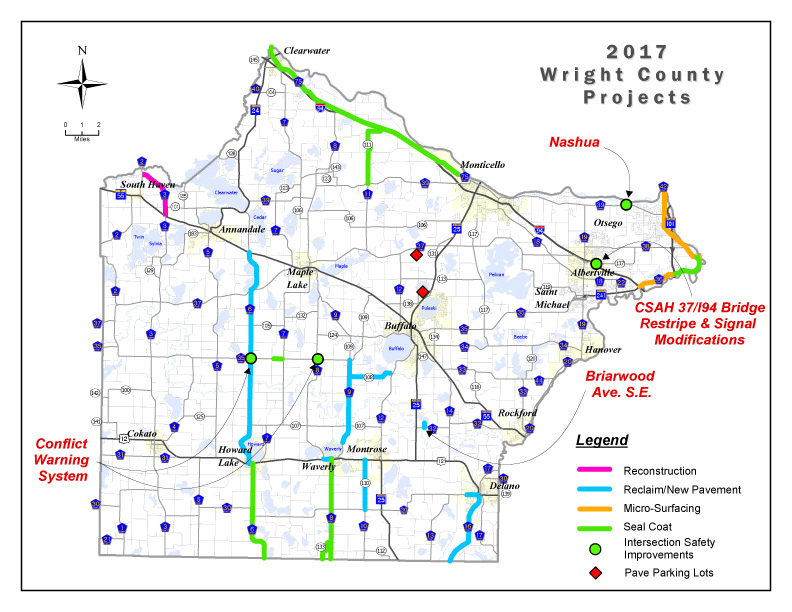 WRIGHT COUNTY, MN – The Wright County Highway Department has announced the 2017 construction projects. The 2017 construction projects total about $10 million dollars in improvements to the county highway system. Safety improvements included in the plan include rural intersection warning systems at the intersections of highways 35 and 6; and highways 35 and 8. Other safety improvements include the construction of dedicated center left turn lanes at the intersection of highway 39 and Nashua Avenue in Otsego, and the creation of center left turn lanes on 37 over the I-94 bridge in Albertville to facilitate safer left turning movements onto I-94.